Blog readers already know it's events brochure season--hopefully you've perused online or thumbed through a hard copy available in our brochure racks. Our sister district, the 34th Street Partnership, just released its own events brochure. Here's a glimpse into what's on deck this summer on Broadway Boulevard, just a couple blocks south of the park. On days when you're not sweating at Bryant Park's Boot Camp or Yoga, do so at Sweat34. This free fitness series, which takes place on Tuesday evenings, will challenge you and inspire you to try something new by offering classes from a rotating list of studios. Expect high-end classes from Tone House, Pop Up Yoga NYC, Ironstrength, and more. 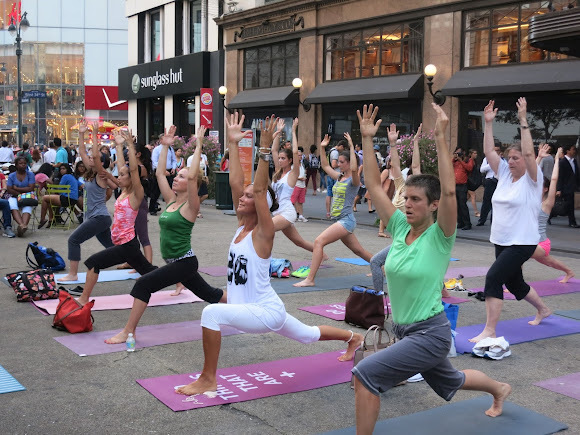 Yogis practice Crescent Lunge on Broadway Boulevard. Follow Talia Castro-Pozo to our sister to the south, as she teaches Salsa to all. Show off your moves with Hoop34, the most fun workout this side of The Big Island. Broadway French Market purveyors bring fresh produce, prepared foods, and specialty gifts to Midtown three times per week. Stay tuned as themed markets are announced throughout the season.